This Halloween was pretty low key for me. I bailed on a perfectly good Halloween party to catch up on my sleep, but not before I got a good look at what Halloween is like on Harrison Blvd. Repent Now Sinners: A large white tent on the corner of Eastman and Harrison claimed itself to be the Boise Baptist Church group in GIANT RED LETTERS. There was a large table with lots of flyers and a small bowl of candy. Beware Those Who Enter: A block up on the opposite side of the street, homeowners had enclosed their front yard with cardboard to make it look as if you were entering a castle. Pretty cool until you glanced up to see the PALIN CASTLE sign looming above your head. So I ask parents in the audience, does this bother you? When did it become appropriate to make our children repent their sins and declare their political party before they can get a bite size piece of candy? You're kiddin' me! I guess I should have stayed up to watch the news. I thought being a sinner and voting republican were the same thing. tallulah bell, thanks for pointing out what I missed, that after going to PALIN CASTLE you could repent. That's just perfect. 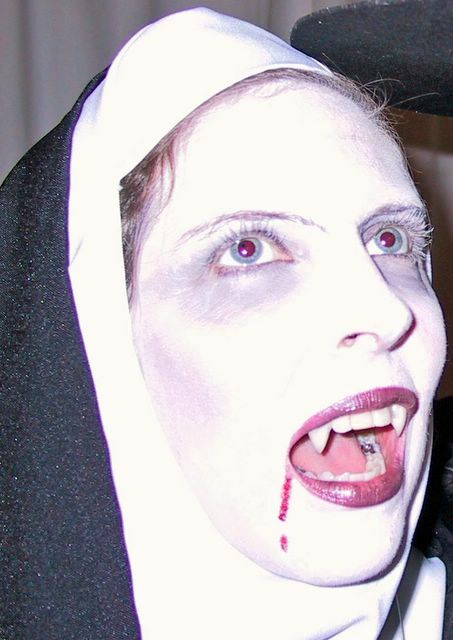 Mixing religion and politics with stuff like Halloween makes me crazy! Like the time my kid brough a religious valentine card home from school. (I actually called that mom and vented my frustration over that one.) But, because those people are the way they are, I'd just give their displays a very wide berth. The ideas should not go together, but it is a different time and all the lines are bleared. This is why I give the miserable little bastards cans of beets. I know you're probably busy, but really, isn't it time for a new post? I miss reading your blog!